Heiner Frei is pediatrician in Laupen, Switzerland. He studied medicine at the University of Berne and promoted to MD in 1977. Specialization in pediatrics at several Swiss University Hospitals with emphasis in neonatology, intensive care and pediatric oncology. In 1987 he started pediatric practice and homeopathic training. His research-activities and publications focus on clinical homeopathic studies about acute ENT-infections, ADHD, H1N1-Influenza and the treatment of multimorbid patients. From 2001 to 2005 he was study coordinator and treating physician in the rigorous Swiss ADHD RCT, which yielded scientific evidence for a specific effect of homeopathic medicines. In this time he also developed Polarity Analysis, a new method to improve the precision of homeopathic prescriptions. 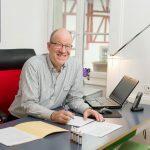 Dr. Frei published four books on the different aspects of polarity analysis and teaches homeopathy in Switzerland, Europe and India. For his work with ADHD patients he received several research awards.